Born of the North Wind ©Thomas D. Mangelsen/Imagesofnaturestock.com. Polar bears are the top predator of the Arctic. Arctic foxes obtain much of their nutrition by scavenging from polar bear kills. The polar bear, Ursus maritimus, is the largest of four currently recognized species of bear in the genus Ursus, which also includes the brown bear (U. arctos), American black bear (U. americanus), and Asiatic black bear (U. thibetanus). Scientists believe that the polar bear emerged as a distinct species quite recently from a common ancestor with the present-day brown bear. Polar bears were well developed as a separate species by the beginning of the Eemian interglacial around 125,000 years ago. Male polar bears measure from 2.4-3.4 m (8 to 11 feet) but may weigh up to 800 kg (1,700 pounds). Females measure from 1.8-2.4 m (6-8 feet) and weigh from 181-317 kg (400 to 700 pounds), though very large pregnant females can approach 500 kg (1,100 lbs). The polar bear's enormous size, like most of its physical characteristics, is an adaptation to life in a frigid environment. Polar bears are completely covered with dense white fur, except for the tip of the nose. Other adaptations to life on sea ice include white fur with water repellent guard hairs and dense underfur, a short furred snout, small ears, teeth specialized for a carnivorous rather than an omnivorous diet, hair on the bottom of their feet, and a layer of insulating fat up to 5 inches thick. Polar bears are so well insulated, in fact, that they give off no heat at all detectable by infrared photography, except for a spot made by their breath ( Stirling 1998). Polar bears have enormous oar-like feet that assist in propulsion while swimming and spread its weight on the ice. Polar bear claws are shorter and more strongly curved than those of brown bears, and larger and heavier than those of black bears, and are adapted to clambering over blocks of ice and snow and to securely gripping prey. While polar bears do not undergo true hibernation, both male and female polar bears can enter a state termed “walking hibernation” at any time of year when food supplies are scarce, a trait not found in any other bear species. Walking hibernation means that the bear’s metabolism alters to a hibernation-like state, which facilitates significant energy conservation. Polar bears may in fact be the most advanced of all mammals in their ability to survive food and water deprivation. Polar bears are the top Arctic predators and are specialized predators of seals in ice-covered waters. While most bears, including grizzlies, primarily subsist on grasses, herbs, and berries, polar bears rarely eat vegetation. Their diet consists almost entirely of meat. Their primary prey species is the ringed seal (Phoca hispida), and, to a lesser extent, the bearded seal ( Erignathus barbatus). Polar bears often eat only the seal's skin and blubber, leaving the carcass for other animals to scavenge. Thus, polar bears are a critical part of the Arctic food chain. During the winter, for example, Arctic foxes feed almost exclusively on the remains of polar bear kills. Polar bears also prey on young walruses and the carcasses of whales, seals, and occasionally adult walruses. Despite their size, polar bears rarely take on adult walruses, which are themselves enormous and fierce. Polar bears can smell animal carcasses miles away. Some polar bears make extensive north-south migrations in response to ice packs receding northward in the spring and advancing southward in the fall. Individuals may travel very long distances to find mates or food. They can run swiftly, but are truly excellent swimmers and are most agile in the sea where they can reach speeds of six miles an hour. They have been seen 100 miles from the nearest land or ice fall. In October and November, males head out onto the pack ice where they spend the winter. Pregnant females seek sites on land or near shore sea ice to dig dens in the snow. They will spend the winter and give birth in the den. Like other members of the bear family, female polar bears have small litters, reach breeding age late in life, and produce few young in their lifetime. Polar bears have one of the slowest reproductive rates of any mammal. Polar bears mate on the sea ice in either April or May. After mating, a female must accumulate sufficient fat reserves to live and to support her cubs from the time she enters the maternity den between late October and mid-November until the time the family emerges in the spring and the female once again begins to feed. The length of time a female must fast varies by region, and ranges up to eight months in the Western Hudson Bay population. By the time they emerge from the dens, cubs are approximately three months old and weigh between 10 to 15 kg (25 to 30 lbs). After a period of several weeks acclimatization, the mother and cubs begin their trek to the sea ice to feed on seals. Polar Treasure ©Thomas D. Mangelsen/Imagesofnaturestock.com. A polar bear mother nurses her ten month old cubs in Western Hudson Bay, Canada. Females nurse their young for up to two and a half years on milk that contains approximately 33 percent fat, higher than that of any other species of bear and comparable to that of marine mammals. The age at which mothers wean their cubs also varies by region, though in most areas cubs are weaned at approximately 2.5 years of age, resulting in a three year reproductive cycle. Polar bears are distributed throughout the ice-covered waters of the circumpolar Arctic, where they are totally reliant on the sea ice as their primary habitat. Polar bears evolved to exploit the sea ice niche, are adapted to survival on this habitat, and do not occur in areas where there is not sea ice for substantial portions of the year. Polar bears depend on sea ice for a number of purposes, including as a platform from which to hunt and feed upon seals, as a habitat on which to seek mates and breed, as a vehicle from which to access terrestrial maternity denning areas, and sometimes for maternity denning habitat itself, and as a substrate on which to make long-distance movements. Because polar bears catch very few seals in open water, sea ice is the essential platform from which they hunt. Polynas are areas of open water surrounded by ice that are also extremely important to polar bears. Polynas vary in size and can be caused by wind, tidal fluctuations, currents, upwellings, or a combination of these factors. 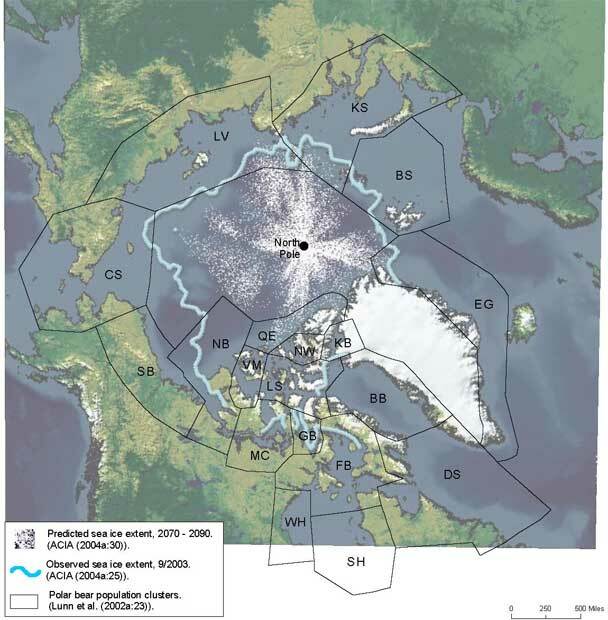 Polynas are areas of increased productivity at all trophic levels in Arctic waters, particularly where they occur over continental shelves, and therefore the sites of marine mammal and bird concentrations. Polar bear distribution throughout the Arctic is determined by food availability and sea ice conditions. Polar bears are most likely to be found in areas where the sea ice and open water meet, and where seals congregate. The IUCN/SSC Polar Bear Specialist Group (“PBSG”), the preminent international scientific body for research and management relating to polar bears, currently recognizes twenty populations, or stocks, of the polar bear species worldwide. These 20 populations occur within the jurisdiction of five countries: the US ( Alaska), Canada, Denmark (Greenland), Norway, and Russia. Some populations occur entirely within the jurisdiction of one nation, while others are shared between two nations. 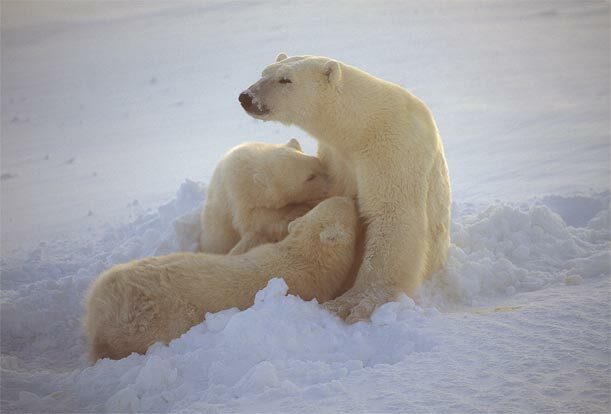 The PBSG last estimated the number of all polar bears worldwide in 2001 at 21,500-25,000 animals. As described in the Center’s Petition to list the polar bear as a threatened species, the polar bear is threatened with extinction by the end of this century due primarily to global warming and the disappearance of the sea ice. Global warming and other threats including oil and gas development and oil spills, contaminants and overhunting in some areas are detailed in the Petition. Amstrup, S.C. 2003. Polar bear Ursus maritimus. In: Wild Mammals of North America Biology, Management, and Conservation [Feldhamer, G.A., B.C. Thompson, and J.A. Chapman (eds.)]. The Johns Hopkins University Press, Baltimore, Maryland, USA. Stirling, I. 1998. Polar Bears. University of Michigan Press, Ann Arbor, Michigan, USA. 220 pp.